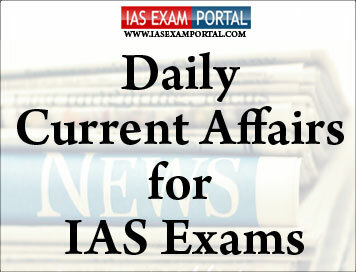 Current Affairs for IAS Exams - 31 August 2018 | IAS EXAM PORTAL - India's Largest Community for UPSC Exam Aspirants. Union Minister of State for Finance and Shipping, Shri. P. Radhakrishnan has said that the Centre would provide all necessary assistance to flood ravaged Kerala. Inaugurating the State Level Bankers’ Committee meeting in Thiruvananthapuram yesterday , he said all public and private Insurance Companies have been instructed to quickly process and expedite settlement of all claims arising out of floods. He pointed out that the government has also extended fresh consumption loan up to Rs. 10,000 on need basis and moratorium on agricultural and MSME loans for one year. Later replying to queries from media, Shri. P. Radhakrishnan said the demand of Kerala for enhancing 3% to 4.5 % of GSDP will be looked into by the Central government. He pointed out that under Prime Minister’s direction, the Centre has given all possible given all possible assistance to Kerala. It has provided the necessary food grains and medicines. The Minister said the Centre is totally sympathetic to Kerala and the Prime Minister has asked, Ministries to consider various demands of the state. The Minister said the Centre is totally sympathetic to Kerala and the Prime Minister has asked, Ministries to consider various demands of the state. Shri. Radhakrishnan said the Centre would provide more assistance after a fresh memorandum is submitted on the loss and damage caused by the deluge. The Kerala government has already informed that they are preparing a new report. Based on that the Centre will send a team to study the situation before taking a decision, the Minister said. The exercise would also stop the drain on the administrative set-up and security forces. Simultaneous elections would further ensure better implementation of government policies on time. The Commission said the draft recommendations were published as the issue was of magnitude. This draft is a product of a balanced view taken by the Commission after receiving public suggestions in favour and against simultaneous polls. The Commission said simultaneous polls should be achieved by introducing “bare minimum” constitutional amendments and with the ratification of the States. The Centre on Thursday announced another annual ranking of higher educational institutions, based on how they fare in terms of innovation. Minister of Human Resource Development PrakashJavadekar announced the institution of the new ranking, which will work parallel to the overall ranking of institutions captured by the annual National Institutional Ranking Framework. ARIIA - named after AtalBihari Vajpayee- will focus on: budget expenses and revenues generated; facilitating access to advance centres; ideas of entrepreneurship; innovation ecosystems supported through teaching and learning; and innovative solutions to improve governance of the institution. A senior official said that there was a slight distinction between research – which is crucial in the NIRF framework – and innovation: research produces new knowledge while innovation puts that knowledge to use. Finance Minister ArunJaitley on Thursday claimed that demonetisation had led to a formalisation of the economy and had made India a more tax-compliant society. “This is the positive impact of demonetisation. More formalisation of economy, more money in the system, higher tax revenue, higher expenditure, higher growth after the first two quarters,” Mr.Jaitley said. Giving details, he said the growth of income tax collections in the two before demonetisation was 6.6% and 9%. Post-demonetisation, the collections increased 15% and 18% in the next two years. “The same trend is visible in the third year,” he said. In March 2014, the number of IT returns filed was 3.8 crore. In 2017-18, he said, the number has grown to 6.86 crore. High discharge of water from China, the highest in 50 years, is threatening to submerge at least 12 villages along the river Siang in Arunachal Pradesh. Hydrological experts said the “unusually high” discharge indicates sudden release of water from man-made barriers or a natural dam that was formed due to landslides caused by major earthquakes in the Tibetan region of China in November 2017. T. Tatak, the deputy commissioner of Arunachal Pradesh’s East Siang district, had on Wednesday issued an advisory warning the people of the 12 villages to be on alert because of the sudden surge in the Siang’s water level. The villages are near district headquarters Pasighat, about 560 km northeast of Guwahati. He cited a report received by New Delhi from the Chinese government saying the YarlungZangbo (Tsangpo) was swelling with observed discharge of 9,020 cumec due to heavy rainfall in Tibet. But the “incremental discharge of 950 cumec” compared to a discharge of 8,070 cumec in the Tsangpo reported on August 14 “should not be a cause for panic”, he said. Nearly 36,000 military vehicles will participate in the drills at Russia’s Tsugol training range in the trans-Baikal region. China will dispatch about 3,200 troops, along with more than 900 pieces of weaponry, as well as 30 fixed-wing aircraft and helicopters, Xinhua reported, citing China's Ministry of National Defence. In presenting the new strategy, U.S. Defence Secretary James Mattis called China and Russia “revisionist powers”, that “seek to create a world consistent with their authoritarian models”. Russian foreign policy commentator Mark Sleboda was quoted by Sputnik as saying that the upcoming exercises are “a clear indication to the U.S. that it’s a response to their national security strategy, as well as a response to U.S. and NATO posturing in the South China Sea, in the Taiwanese Straits, as well as… the permanent stationing of troops that we are seeing on Russia’s western border”. In a heartening development for conservationists, a recent census has revealed that the population of the Nilgiritahr (an endangered mountain goat) at the Mukurthi National Park has grown by an impressive 18% in the last two years, from 480 to 568. Getting an exact figure each year is difficult, so there is always a small discrepancy in numbers. This year, however, there is a definite increase in the number of animals in the only pristine habitat left in the Nilgiris for the tahr,” said a Forest Department official. Tamil Nadu Forest Department officials said that a count conducted in 2016 had put the population in the national park at around 480, but a revised count in 2017 pegged it at 438. “Getting an exact figure each year is difficult, so there is always a small discrepancy in numbers. If that is the good news, the bad news is that the population also faces several threats. Researchers point to the continuing spread of invasive species of flora, such as wattle and pine, and exotic weeds like scotch broom ( Cystisusscoparius ) and gorse, which end up diminishing grazing land. The rise in the animals’ population has led to a few herds migrating out of the national park, into the erstwhile Nilgiris South Forest Division. The population estimation exercise, completed in May, was conducted jointly by the Forest Department and the Department of Zoology and Wildlife Biology, Government Arts College, Udhagamandalam. The GeM has completed two years and as on 26th of August 2018, it has crossed ₹ 10,800 crore in value terms and 6.96 lakh in volume of transactions through the platform. More than 1.35 lakh sellers offer 4.43 lakh products on the GeM platform which has 26,500 organizations as buyers. While all States and Union Territories are buying through GeM, 25 States and UTs have already signed anMoU to make procurement through GeM mandatory. It has led to an overall average saving in cost of procurement to the tune of about 25%. Luka Modric of Real Madrid and Croatia on Thursday received the accolade of UEFA Player of the Year after his Champions League exploits. Men’s relay squad claims the silver; bronze medals for discus thrower Seema and Chitra in 1,500m while Jinson Johnson claimed Gold in 800m race at the Asian games being held in Jakarta. The Indian team too had some major changes. Missing was the Asian champion NirmalaSheoran, who had finished fourth in the 400m earlier, and surprisingly Hima Das, the new national record holder and a silver medallist in the quartermile here earlier, did not run the last leg.